Jam has got to be a British favourite. There are jams for all seasons, all tastes and preferences. Whether you like your jam smooth and jelly-like or prefer a thick fruity conserve, on toast or as filling in a cake, the chances are that there's a recipe out there that will delight your taste buds. Making your own jam really brings you back to basics, and has got to be one of the highlights of living a bit of the 'Good Life'. This is especially so when you are able to pick your own fruit, rather than using shop-bought pesticide-laden commercial produce. Using freshly picked ingredients - whether resorting to moderately ransacking wild hedgerows (always leaving enough for the wildlife!) or picking fresh from your own garden or allotment - will bring you in line with the seasons. Buying from the supermarket often removes us as consumers from the delights of seasonal produce. When it comes to food, it could be said that nature knows best, and foods that are grown and harvested seasonally will pretty much always out-perform fruit and vegetables that are grown intensively and flown in from all corners of the world. Because you ideally need to use the fruit as quickly as possible after they are picked, food that has stored or accumulated food miles will lose a lot of it's taste and nutritional value. That's why homegrown produce is so good - food miles turn into food metres, and you can really taste the difference. The Perils of Jam Making! Jam making involves a lot of very hot liquid - therefore it goes without saying that you should be extremely careful with regards to your health and safety. When transferring liquids or stirring the jam also opt for oven gloves and tea towels - try not to wear open-toed shoes in case you drop a pan or splash yourself. Bear in mind who will be around when you're jam making - animals and children can cause accidents, so it's ideal that you have the kitchen to yourself. It's also a good idea to think carefully about the equipment you'll be using. Recipes that involve high sugar content may bubble and splatter, therefore it's essential that you use a large pan that can 'contain' any spluttering and splashes. A large pan will also mean that you don't need to fill it to the top, something that can be a bit of a safety hazard when transferring and handling the pan. A good preserving pan is the mainstay of any jam maker's kitchen tools. Ideally the pan should be heavy in weight, and made of stainless steel. A poor quality, thinner pan can lead to burning of the jam at the bottom, which can taint the taste of your jam. A preserve pan with sloping sides also means that the evaporation of the jam is helped and not hindered. This process is vital in creating a concentrated preserve that will set properly and keep. Of course, you will also need to use jars that have been sterilised. This can be done by placing the jars in boiling water for 10 minutes, before drying in the oven upside down at Gas Mark 3/160C/325F. These can be jars that have been saved for re-use, or purpose-bought jars with sealed lids. If you have opted for re-used jars, may need to buy some covers. You can opt for waxed lids with a cellophane cover, secured with an elastic band. The idea is that the wax melts and forms an airtight seal, which is why you should always make sure that you have the correct size seal for your jars. Discs that are too small or too big for the neck of the jar will allow air in, which in turn will cause the jam to turn mouldy. A thermometer is also a very useful piece of equipment, particularly when testing that the jam has set appropriately. This recipe is for a traditional and relatively simple raspberry jam recipe. It's a great recipe for any jam making novice, and is quite cheap if you are able to pick your own produce. You can also take a knob of butter and lightly 'grease' the pan, which will discourage the formation of any scum (air bubbles that cause a frothy appearance on the surface of the jam). This recipe will make around 5lb of Jam and should take around three quarters of an hour. 1. Wash and drain off the raspberries before placing in the preserving pan and very gently simmer for around 10 minutes. During this time, the juice will be gradually extract itself from the fruit, causing the raspberries to become very soft and tender. 2. The raspberries should then be taken off the heat. Add the sugar, taking care to make sure that it is stirred in until completely dissolved. 3. The pan can then be put back on the heat and brought to the boil. 4. Once the mixture has been brought to the boil, it should be boiled rapidly for 5 minutes. During this time you may notice the formation of frothy 'scum' in the jam. 5. After 5 minutes of rapid boiling any scum needs to be removed if you opted not to grease the pan beforehand. To do this, take the jam off the heat, and allow the jam to set for a while. Then take a small knob of butter and add to the jam, which will help to diffuse the froth. 6. You will then need to test how well your jam has set. If you have a thermometer, you can simply warm the thermometer up by dipping in hot water, before placing in the jam. The temperature needs to read 105C/220F to obtain the right setting conditions. If you don't have a thermometer, try putting a little jam onto a fridge-cooled plate. Leave the jam for around a minute and then gently nudge the surface of the jam. Any wrinkling indicates that setting point has been reached. 7. 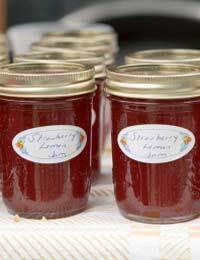 If you are satisfied that your jam has set properly, you will then need to pour it into your jars and seal. It is important that your jars are airtight and sealed as quickly as possible - straight away is ideal. Remember to label and date your jars! Just made the raspberry jam and it smells gorgeous, may be a silly question but how soome can I use it?